The concept of bitcoin days destroyed has been proposed as a measure of bitcoin volume. However, I don't think the bitcoin wiki really explains the idea very well. What is the purpose or advantage of knowing this statistical value? The idea of "bitcoin days destroyed" came about because it was realised that total transaction volume per day might be an inappropriate measure of the level of economic activity in Bitcoin. After all, someone could be sending the same money back and forth between their own addresses repeatedly. If you sent the same 50 btc back and forth 20 times, it would look like 1000 btc worth of activity, while in fact it represents almost nothing in terms of real transaction volume. With "bitcoin days destroyed", the idea is instead to give more weight to coins which haven't been spent in a while. To do this, you multiply the amount of each transaction by the number of days since those coins were last spent. So, 1 bitcoin that hasn't been spent in 100 days (1 bitcoin * 100 days) counts as much as 100 bitcoins that were just spent yesterday (100 bitcoins * 1 day). Because you can think of these "bitcoin days" as building up over time until a transaction actually occurs, the actual measure is called "bitcoin days destroyed". This is believed to give a better indication of how much real economic activity is occurring on the bitcoin network. So how well does it work? Well, it's still not perfect, because the other day I moved some coins out of a wallet they've been in for several months without spending them or giving them away. And some genuine businesses have very rapid turnover in bitcoins, so they're not being measured well by this method. But it does do a good job of filtering out the "noise" of bitcoins that are just "bouncing around" without really going anywhere. The graph of overall bitcoin days destroyed is believed to show that the genuine level of activity in the Bitcoin economy is continually increasing--it's not just one person experimenting by rapidly sending the same coins back and forth, flooding the network with meaningless chatter. Looks pretty good, hey? Image from the Bitcoin wiki. The above graph is in percentage of bitcoin days destroyed and a little out of date--for a regularly updated version in bitcoin days destroyed check out Bitcoin Days Destroyed - Active Chart instead! I personally prefer to think of bitcoin days destroyed as a measurement of "hoarding", not as a measure of economic activity. Steep parts of the chart represent a high number of bitcoin days destroyed which as nealmcb states could be early adopters cashing out or moving coins between wallets. It does not necessarily not represent increasing transaction volume. It seems that a regularly-updated graph of Bitcoin Days Destroyed is at http://banana.mine.nu/daysdest.html But note it differs from the graph on the wiki in that it seems that it graphs "bitcoin days destroyed", rather than "percent of bitcoin days-to-date destroyed". The latter is what ABE labels "% CoinDD", which he reports as 36.1245% as of block 145677 at 2011-09-17 06:18:18. But the calculations seem to have other differences. E.g. the ABE result for block 131400, which was also around June 17 2011, was "Cumulative Coin-days Destroyed: 35.1672%", but the value from the wiki graph is about 28% on June 17. The corresponding value on the banana.mine.nu graph is about 900,000,000 bitcoin days. 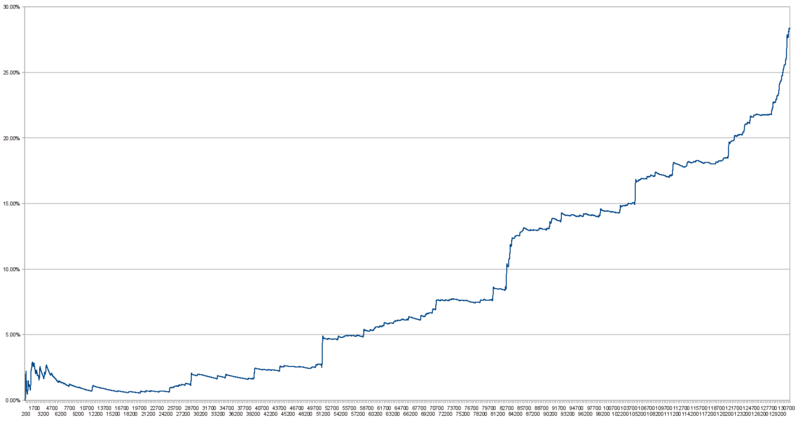 I'd say that in general a graph of "% CoinDD" seems much more helpful than a raw number which always goes up. Note e.g. that according to ABE, the percent value has barely increased between June 17 and Sep 17. Is there any regularly updated source for a percentage-based graph? By closely watching this metric you can identify upward spikes which are likely times where early bitcoin adopters may be "cashing out" or spending their early coins. But note that they could also instead just be moving coins around internally, e.g. moving coins to a better-protected wallet. But "% CoinDD" is still less affected by such movements than the overall transaction volume metric is. Bitcoin Days Destroyed weights the past dormancy of coins that have been transferred over any chosen period. The histogram of the percentage of Days Destroyed graphs distribution of dormancy over the measured period. The graph is a histogram showing the percentage of total Days Destroyed from the measured period for each block. Thus it is a distribution of dormancy over the period, since block numbers are ascending forward in time. Bitcoin Days destroyed cannot show exactly how many bitcoins are in dormant. An interesting related measurement is called Dormant Bitcoin Chart, which shows the dormancy of all bitcoins. Not the answer you're looking for? Browse other questions tagged economics terminology bitcoin-days-destroyed or ask your own question. How is “days destroyed” different from “amount of BTC” in existence? Can we interpret a rolling average transaction count per block as the 'adoption curve' for Bitcoin? BTC Days Destroyed, Lifo or Fifo?